Only a filmmaker like Akira Kurosawa could take a simple film and somehow make it a masterpiece in the process. Perhaps it is the perfectionist attitude, which had Kurosawa rehearsing scenes repeatedly before ever starting the cameras. Or perhaps it was his ambitious attitude, doing an eight minute scene in one take. Either way, High and Low remains one of the best police procedural kidnapping films ever made, beginning with a great twist. Loosely based on Ed McBain’s King’s Ransom, which was made into a Hollywood picture in 1959, but Kurosawa creates his own version. The film opens with Kingo Gondo (Toshiro Mifune) patiently listening to a group of men explain their business goals for the shoe company Gondo works for. After taking a moral stance refusing to make shoes that are cheap in order to turn a better profit, Gondo reveals that he has risked all of his finances in order to attempt his own plan at making shoes which are both stylish and durable. This plan is cut short when a group of kidnappers call and claim to have his son, asking an incredible amount of money for his return. The story becomes even more interesting when it is discovered that Gondo’s son is just fine. The kidnappers have accidentally taken the chauffeur’s son instead. Gondo is still forced with a difficult ethical dilemma in deciding whether or not to help the boy which is not his own blood. The arrival of the police brings more characters and an intricate plan of detailed work in order to find the culprit responsible for the kidnapping. 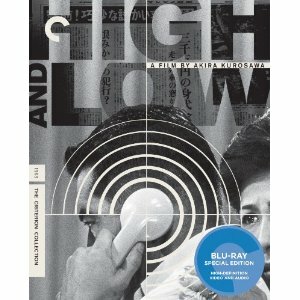 This Kurosawa classic comes to Blu-ray with a high-definition digital restoration, and the original four-track surround sound presented in DTS-HD Master Audio. The film also comes with an option audio commentary with Kurosawa scholar Stephen Prince. The special features also include a thirty-seven-minute making-of documentary, which is actually a segment taken from the Toho Masterworks series. There is also footage of a rare interview with Kurosawa regular, Mifune, and another interview with actor Tsutomu Yamazaki. The package also had a booklet insert, with an essay by film critic Geoffrey O’Brien and an on-set account from Japanese film scholar Donald Richie.